A 17-year-old male juvenile was transported to Baxter Regional Medical Center Tuesday morning and charged with reckless driving and DWI drugs following a one-vehicle accident. The accident closed U.S. Highway 62B in Mountain Home due to downed utility lines and a natural gas leak. Mountain Home Police Chief Carry Manuel says the juvenile was released into the custody of his parents at the hospital. The driver's name is being withheld at this time because he is a juvenile. Chief Manuel says his name may be released later, since the teen was charged as an adult. According to the accident report, the vehicle is owned by Tracy and Karen Thurman of Mountain Home. The crash occurred when the juvenile, traveling alone, was eastbound when he crossed both lanes of traffic, left the roadway and drove on the roadside. His vehicle then struck a utility pole breaking it before continuing east. The truck then struck a gas line causing damage and allowing natural gas to escape. 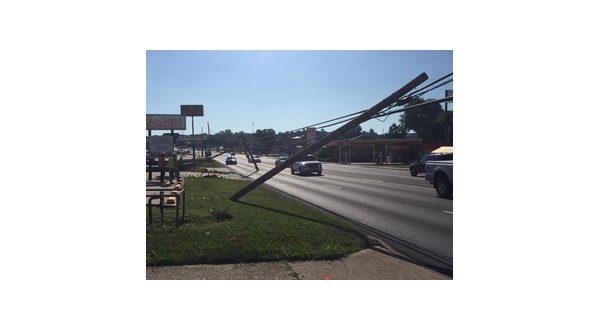 The vehicle continued east striking a second utility pole causing it to break. The truck then entered the highway crossing all four lanes and struck landscaping in front of the White Oaks Station after exiting the roadway. The vehicle continued before coming to a stop behind the Florida Center. The vehicle was still running and in gear with the driver exiting the driver's side of the truck when law enforcement arrived at the 7:16 a.m. accident. Combined damage estimates to three utility poles, cable/Internet lines, natural gas lines and landscaping was set at $18,500.